Martlet staff and volunteers, Spring 2018. Volunteers are incredibly important to the Martlet, and make a lot of what we do possible. If you are looking to get involved with us, we will find a place for you and help you learn the skills you need. You might think we’re only looking for volunteer writers, but we’re also always looking for photographers, illustrators, editors, copy editors, and more! Volunteering for the Martlet is a great way to build your skills in writing, editing, photography, and art. It’s also a great way to network with like-minded individuals passionate about the same endeavours and, heck, even make a great group of friends! We might add that getting your name published in print or online is kinda thrilling — and a great thing to boast about in your portfolio, LinkedIn, or resume! Want to write for us? We’re here to help you get started. If you have a story idea of your own, you can send it to our Editor-in-Chief. If you’re in need of a little inspiration, you can attend our weekly story meetings to get some ideas, or you can sign up for our pitch list and keep an eye out for a story that piques your interest. Once submitted, your story will undergo approximately two rounds of edits (sometimes more, but not often). Our editors usually use Google Docs to collaborate with our writers, so if you haven’t already, check it out! If you’d prefer a more hands-on approach, you can arrange to meet with your editor during the first round of edits to help familiarize yourself with the editorial process. For all of your stories, please include all relevant contact information (phone numbers for interview subjects as well as email addresses) and websites (links to source documents) for fact-checking purposes. It’s also a great idea to hold onto your interview recordings, time-stamped transcriptions, and interview notes, too! If you’d like to be part of the Martlet’s story pitch list, subscribe below! Lots of stories also require illustration or graphic accompaniment. If you want to be the one to do it, read our Graphics Guidelines and then get in touch with our Design Director. If you’d like to be part of the Martlet’s graphics pitch list, subscribe below! Do comma splices make your lower lip start to tremble? Come copy edit at the Martlet office (SUB B011) every other Tuesday from 4–7 p.m. (or however long it takes), and you can help catch errors in the paper before it goes to print. Pizza for all proofreaders. No knowledge necessary, but if you are interested in Canadian Press styles, our Martlet Style Guide is a great introduction. Questions? Shoot our Editor-in-Chief an email. Want to snap shots of your favourite performers, political big-wigs, protests, or sports? We can provide some gorgeous equipment (Canon T3i, tripods, lights, microphone, Creative Suite software and more for you to use). Volunteer to snap some photos for the Martlet and all this could be yours. We will even give some hands-on instruction to those who are a little camera shy. Just remember to follow our Image Submission Guidelines in order to get the best shots, from real life to print. To book equipment, send an email to our Editor-in-Chief or stop by the office. If you’d like to get involved with photography with the Martlet, email our photo editor and Editor-in-Chief. We have plenty of other things that need creative and enthusiastic minds. We host regular information tables to let people know what we’re up to. Our website and archives need sharp minds too, if you are interested in helping clear our digital cobwebs or improve our office efficiency, email the Editor-in-Chief, or stop by the office anytime. Meetings are a great way to see how the Martlet works and will give you the opportunity to voice your ideas and opinions about the paper and its content. 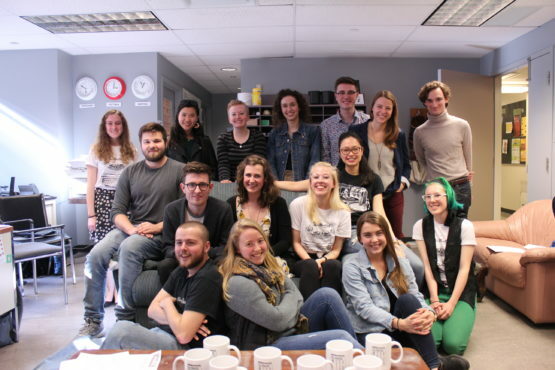 The Martlet also hosts workshops throughout the year on everything from shooting photos and video to copy editing, as well as super cool question and answer sessions with notable Martlet alumni and members of the journalism community in Victoria and beyond. If you follow us on Instagram, Twitter, or Facebook, or sign up for our Newsletter/Pitch List, you’ll hear all about them. Check out our workshops page for more information. The Martlet is made up of a lot of hard working people with a variety of talents, perspectives, and ideas. We want everyone to have a say and those who contribute get the ability to help make decisions about what we do and how we do it. Being a volunteer Staff member further integrates you into the team, and is a great resume-booster! You will also get invites to some pretty rad parties, like our Staff & Volunteer appreciation events. To learn about becoming a volunteer Staff member, check out our Staff Policy.